Goodbye, sore feet! While we all love our beloved high heels, there is a way to score a heightened look sans the discomfort. Lucky for you, the Shop With Us team has spied a pair of wedge booties that serve up stylish flair and the height you love. Even better, this sporty design is the newest addition to the Nordstrom sale rack! See It: Check out the Linea Paolo Felicia Wedge Bootie at Nordstrom for only $90 (25 percent off the original price of $119.95) while it’s still in stock. The Linea Paolo Felicia Wedge Bootie is a street style must-have. The 2.5-inch inch heel and half inch platform offer support for a comfortable wear all day long. Crafted with a leather upper and side zip closure, this pick is perfect for fashionistas who are obsessed with adding camo prints to their arsenal. 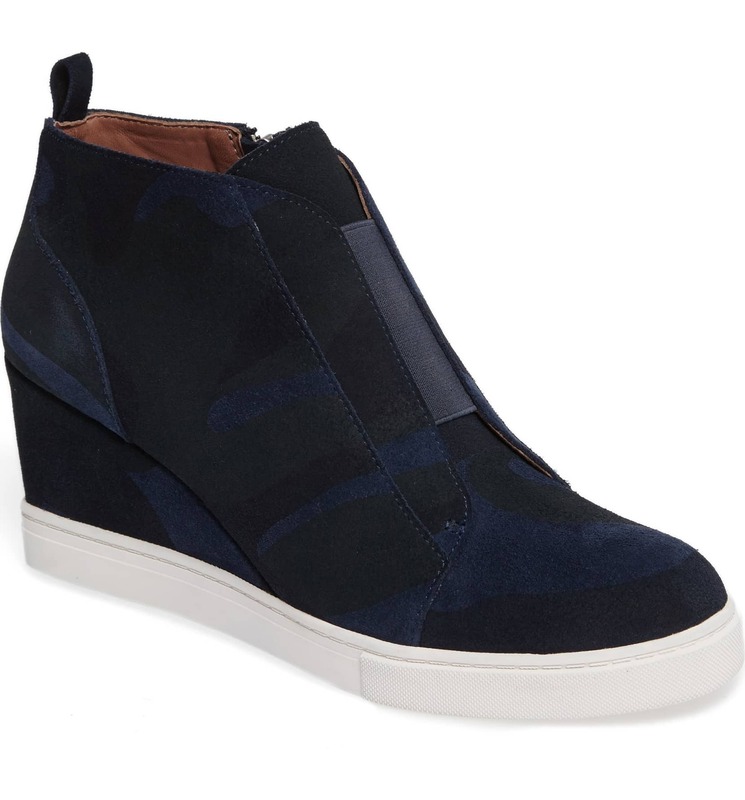 Suave and sporty, these wedges are ideal for a day or night on the town. Available in two shades, including black with a dark grey print suede and dark navy print suede, these wedge booties will mix and match with your wardrobe easily. Hitting the Nordstrom rack with a 25 percent off markdown, this design won’t break the bank. The shoe can easily be dressed up or down. From casual Fridays at work to your weekend style, you can count on these wedges to go the distance with your wardrobe. You can even wear these comfy shoes while running errands. Wear these booties with leather leggings, a T-shirt and a double face coat for a no-fuss look. You can even switch gears with skinny jeans, a bodysuit, a leather jacket and a cross-body bag to grab drinks with friends. Thinking of a work ensemble? Team with a fit and flare dress, a boyfriend blazer and a hobo bag for a stylish finish. Ready to shop? Sizes 4 to 13 are currently up for grabs, so we recommend purchasing your size while it’s still in stock. See It: Grab the Linea Paolo Felicia Wedge Bootie at Nordstrom for only $90 — down from $119.95 (at 25 percent off).